We are savoring the seasonal changes since the spectacular light show and rain on the 18th. The grass grows quickly in places with temperatures in the low 80s during the day and 50s at night. With softer ground and cooler weather, the cows have moved up the hill and to the ridges for fresh green grass, leaving their calves behind in the flats where we’ve been feeding hay since they were born. Expecting dinner, there was quite a bit of confusion among the calves Sunday evening when the cows weren’t home on time, still high on the hill filling up before dark. Despite their instinctual training to stay where they last sucked, the calves went looking for their mothers in the only geography they knew. Robbin and I couldn’t contain our laughter as the chorus of plaintive bawls on either side of the house became overly urgent and dramatic—and just as humorous when the worried cows returned to finally find and chastise their offspring in strident tones. Now a month or so old and growing, the calves have become more independent, running and bucking ahead of the plodding cows to the water trough at dawn, butting heads as they emulate their mothers, some of whom have begun to cycle. A sign of good health, it will be six weeks yet before we put the bulls out. After four years of drought and a long hot summer, we welcome the changes, and as always this time of year, we wait for a little moisture to freshen-up the new grass on our bare west and south slopes as the clay dries out without the protection of old feed. I had to cut a load of dead Manzanita yesterday to celebrate all these welcome changes. 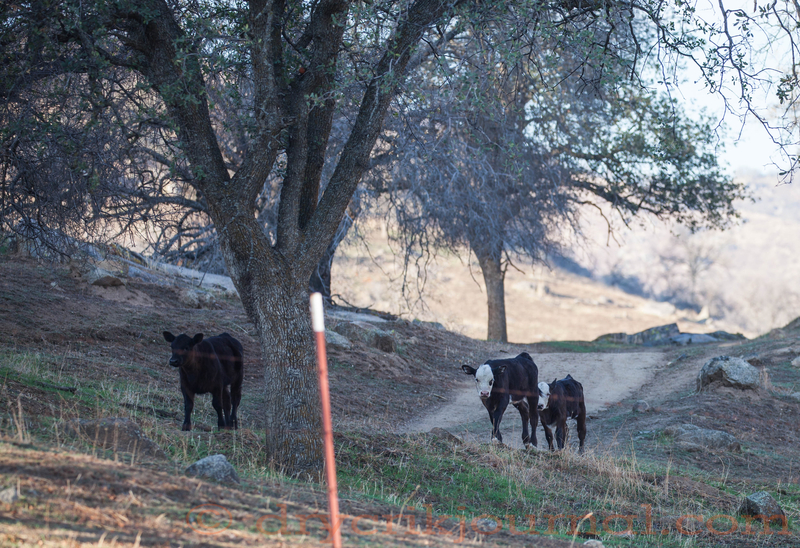 This entry was posted in Photographs, Ranch Journal and tagged Calves, change, cows, discipline, grass, rain, seasons. Bookmark the permalink. So happy to read about rain and laughing at the dumbness of cattle, the latter displayed every summer when we encounter them in Wyoming. We, of course, don’t find cattle ‘dumb’, but rather that giving them time to think makes our job so much easier. How exactly they organize and decide who babysits the calves first as the rest of the cows graze, and who will be the one to relieve her, has always puzzled me, though I have my theories. Sentient beings and the epitome of motherhood, I’ve always admired their fairly peaceful and zen behavior and not surprised that cows are the subject of many mythologies and even worshipped in some cultures. Perhaps I’m mincing words, but I would say they appear more childlike and slow-thinking than dumb. Nothing quite like life on a ranch . . . The clay slopes are a challenge. Damn sure are, neighbor. Maybe we’ll get a little moisture tonight or Monday. Perhaps it only takes several lifetimes to understand the ways of other creatures who have developed their relationship with the land over the millenia. I was once advised that it takes that long to learn to handle a spade bit correctly. Humility and good hands, Pat, with most things. Assuming that we are not born with the answers and that most things worth knowing take time helps open the doors. The day we stop learning we’re ready for the grave. Cheers, my friend! This such a wonderful time of year. I’m so glad we moved back to a more rural area. I was out for a walk this morning on the Marsh Creek Trail behind our community and ran In to a group of wild turkeys. Animals are incredible creatures. I learned from a comment on this blog that a ‘group’ of turkeys is a ‘rafter’. Just passing it along, Angeline, to impress your friends. Thanks for concurring that this is a wonderful time of year. I knew there had to be a word for that! Thanks, John. Reading your post today I ‘m realizing how joyous that thunder and rain concert must have been given the amount of drought you have had–I enjoyed your picture of the babies going up the hill. Poor calves were on the hunt for their mothers. You would think that after the eons of “domestication” and study, that there would be no mysteries left to the cow. We never stop learning in this business. Thanks for the link C.G., another good example of cow intelligence. So many remind me of people I know, except cattle make more sense–perhaps not the sense that people make of things, but sense I understand (eventually).